PETERHEAD BOYS CLUB PLAYERS (L TO R) DYLAN MARSHALL, MATTHEW CLACHER,RYAN RITCHIE AND JAMIE MATTHEW GET THEIR HANDS ON THE LEAGUE CHALLENGE CUPAND THE PREMIERSHIP TROPHY AS THE SPFL TOUR REACHES BALMOOR STADIUM. Peterhead Football Club have announced a formal partnership with Peterhead Boys Club. The announcement was made during the SPFL Trust’s ‘Trusted Trophy tour’ visit to Balmoor last Tuesday night which saw SPFL trophies visit the club as part of a Scotland wide tour. The partnership will see Peterhead Boys Club receive coaching from Peterhead FC coaches twice a month with PFC hoping to bring in specialist coaches two to three times a year such as Food and nutrition specialists and goal keeping coaches. Beyond this, every player at Peterhead Boys club will receive a season ticket to Blue Toon matches; over 200 season tickets in total. There will also be match day tickets made available to coaches from Peterhead boys club to reward them for their hard work. 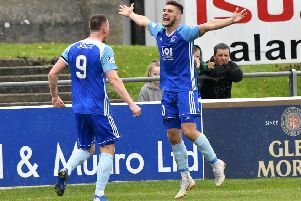 Furthermore, Peterhead FC will make available advertising space at Balmoor which will be sold by Peterhead Boys Club, in line with the current pricing structure, and will allow them to keep the proceeds. Peterhead Boys Club Treasurer Dianne Beagrie commented: “On behalf of Peterhead Boys Club we are delighted by the recent initiatives being put in place between ourselves and Peterhead Football Club. “There has always been a close link between the clubs but now all our players will benefit from having their own season ticket for the forth coming 17/18 season which will allow the town to get behind the club in greater numbers and hopefully see PFC have successful year.